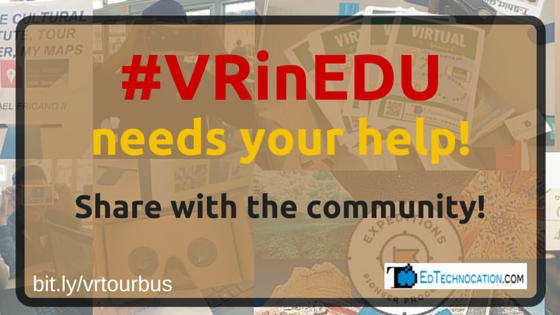 EdTechnocation: #VRinEDU needs your help! Share with the community! #VRinEDU needs your help! Share with the community! In an effort to help build upon the resource site I'm developing and to grow the #VRinEDU community, I'm asking for your help! I'm currently crowdsourcing two types of information: student devices and favorite VR apps. To help contribute and become part of the #VRinEDU community, read on! As we all continue to explore the possibilities of virtual reality in the classroom, use the hashtag on social media to ask your questions and to share resources and ideas! If you are currently exploring a student device for use with Google Expeditions and other VR apps or if you've already purchased a set of student devices, please contribute to my list! To see the growing list of teacher recommended student devices, visit my Device Options page and scroll to the bottom. What is your favorite VR app? My list of VR Experiences is constantly growing as I continue the search! But I want to know: what VR app or experience is your favorite? Share your favorite by filling out the form below and explain why! To see this growing list of teacher favorites, visit my VR Experiences page and scroll to the bottom.